As a visitor to this website, you probably are someone who cares about where your food comes from. And you may have your own garden in order to have more control over your food sources and to enjoy the flavors of homegrown produce. And you are probably aware of just how important bees are to the pollination of our homegrown food. When it comes to pollination, people first think of honeybees. But, we can’t all keep honeybees in our backyards, can we? That’s why I wanted to do an episode on mason bees. They can take a lot less care than a honeybee. And yet, they can still have a significant impact. The bottom line is that mason bees can help you grow more food in the same space you already have. And that’s a good thing! 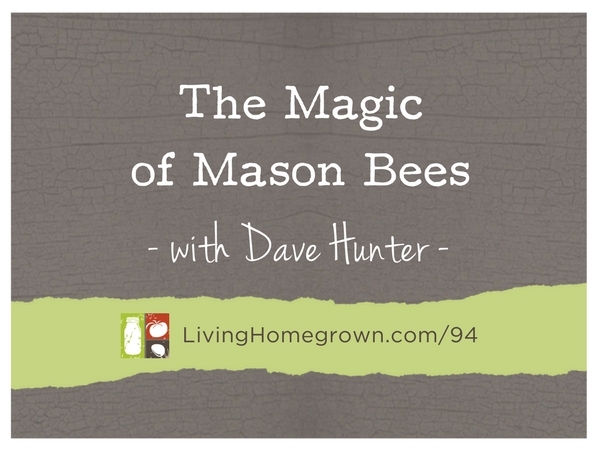 In this week’s podcast, I interview Dave Hunter of Crown Bees and he gives us the whole scoop on mason bees, why they are important and how we can help them thrive. 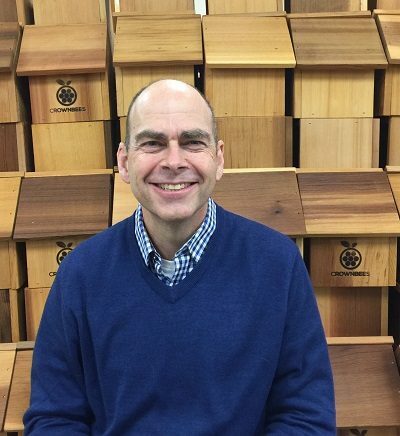 Dave is the founder/owner of a Washington State business called Crown Bees that opened their doors in 2008. Their mission is to provide more food for the world using hole-nesting gentle bees. Crown Bees supplies native bees, products, and great education through an online website and hundreds of nurseries across the US and Canada. One of their key features is that they care about what they sell. They send out a monthly BeeMail newsletter telling their readers exactly what to do and expect each month for raising hole-nesting bees. Dave founded the commercial mason bee industry in 2009 which operates as the Orchard Bee Association and was the president for the first three years. Dave is also on an advisory board to a multiyear USDA “Integrated Crop Pollination” project and is a member of the World Osmia Council. He recently co-authored the book “The Mason Bee Revolution” and loves talking about the future of bees. I’ve been meaning to write and thank you for including a show transcript on your podcast episodes. THANK YOU for providing a transcript of your podcast! I am severely hearing impaired and I can’t simply listen to a podcast because I will not understand at least 50% of what is spoken. You include transcripts in your show postings, and this literally makes a world of difference to me. Without these transcripts I would not be able to access and use the information you share. Many, many thanks from me to you! Oh Donna I am so glad you let me know that you find them helpful. Most podcasters do not include the transcript because it is expensive to do it. But I know there are many who prefer the written word over audio and that there are people like you who would be left out if I didn’t do it. So it really warms my heart to know you find them so helpful! Thanks for letting me know and ENJOY! I am new to this podcast but I just wanted to say THANK YOU! I stumbled upon this episode which was beyond informative and really inspired me to make my garden and yard more bee friendly! I have been “binge listening” to so many of your episodes now and each one is as great as the last. Please keep up the great work, from a serious fan in Wisconsin!